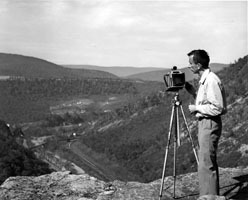 Photographer Marion Edwin Warren was born near Billings, Montana on June 18, 1920. His early years were not exactly halcyon; the failure of his parent's farm and their subsequent removal to Sikeston, Missouri, was followed within a year by the deaths of first, his twin brother Louis, and then his mother Lois Banfill. Marion and his father William moved in with William's parents, while Marion's older brother Dwight went to live with their aunt, Edna Warren. Marion spent the next four years living and working on his family's several farms, until 1932, he moved to St. Louis to live with his brother and aunt. Edna Warren was a feature writer and cultural arts critic for the St. Louis Globe Democrat, and she instilled discipline into the young Marion through her insistence on properly completed schoolwork and her expectation thathe support himself as soon as he was able. She also encouraged him to love the arts by taking him to cultural events with the tickets she received as a part of her job. Marion became fascinated with photography during his junior year at Ben Blewitt High School. He purchased his first camera, an Argus, for $12.50, and became the yearbook photographer. After graduation, the company that produced his yearbook hired him as a go-fer. The job was temporary, but it gave him an inside view of the career he wished to enter. After a short stint at the Hadley Vocational School, Marion got a temporary job making lantern slides at the Barnes Hospital in St. Louis. 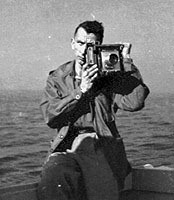 The regular photographer at the hospital, Mr. Needlinger, became a mentor for Marion, teaching him many developing techniques that he still uses today. At that time, pre-packaged chemicals were not reliable, and photographic materials not as standardized as today. Photo chemistry was a necessary study for photographers then, and Marion built on the knowledge he gained from Mr. Needlinger by taking courses at St. Louis University in photo chemistry and Washington University in advertising photography. studio in St. Louis doing retouching for the Christmas portrait season. Although he had never done retouching before, and hated the idea of heavily retouching portraits once he had learned it, retouching later proved to be a valuable skill when he opened his own portrait studio. After the Christmas season, Marion was laid off from Ashan-Brenner, he spent six months as a freelance photographer before joining the Day Studio, one of the finest commercial studios in St. Louis. There, Marion did everything from fashion and advertising to commercial and publicity photography. Most importantly, he did news photography. During these assignments, he was working side by side with the Associated Press photographer, and when during a slack period at the Day Studio Marion was laid off, he was able to get a job for the summer doing news photography for the AP. At the same time, Marion was becoming more involved with art photography. In 1939 he joined the St. Louis Camera Club, and began exploring pictorial composition. He also began entering competitions sponsored by the camera clubs and winning awards for his work. In 1942, Marion was drafted into the Navy. At first, he was sent to boot camp like the rest of the raw recruits, but his insistence on writing in large letters on every form that he had AP news experience soon had him picked for a special unit of Navy photographers who were to be on call to take pictures for the Secretary of the Navy, the White House, and the Joint Chiefs of Staff without the routine paperwork. Among his duties was making portraits of dignitaries and officers, including Admirals Halsey and Nimitz, and Commander Douglas Fairbanks, Jr. In 1943, Marion was assigned to photograph a reception for the WAVES, and their British counterparts, the WRENS, in Washington. When he arrived, he asked for a volunteer to take down captions for the evening, and Yeoman Mary Giblin agreed to help him. As Marion puts it, "since she followed me around all evening, the least I could do would be to take her to dinner." They were married in October of 1943. At the end of the war, Marion was accepted into a Steichen unit, one of the Navy combat photography units commanded by Captain Edward Steichen, who was one of the most famous American photographers of this century. After his cruise to Europe and work on an exhibit with Captain Steichen, Marion Resigned from the Navy and joined the staff of Harris and Ewing as a portrait photographer. The pay, however, was less than what he had received in the Navy and by this time Marion and Mary had two children, Paul and Nancy. Among the side jobs Marion took in order to support his family was doing photo finishing for Carleton Mitchell, a wartime friend whose hobby was photography and writing. Mitchell finally hired Marion full time, and the Warren family moved to Annapolis, with the understanding that Marion be able to develop a studio business of his own while he was working with Mitchell. By the early fifties, the Warren family had increased by one more, their youngest child Mame, and Marion’s studio business – then located at 88 State Circle – had increased to the point that he ceased to work with Carleton Mitchell. Marion had six employees, and was involved in commercial work as well as portraiture. 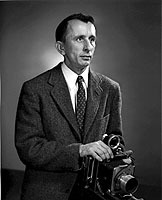 He also became the photographer for the State of Maryland's Department of Information, a job that had not existed before the administration of Governor McKeldin. At first, Marion did jobs for the state gratis, and was paid out of the remainder of the budget at the end of the fiscal year, or by exchanging photography of state parks for family vacations throughout the state. 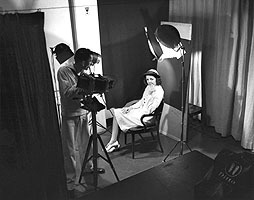 Under Governor McKeldin, however, photography became increasingly important and Marion was often called in to do photographs of visiting dignitaries, such as Queen Elizabeth, President Eisenhower, the Duke and Duchess of Kent, and Queen Elizabeth the Queen Mother, as well as state events and the annual Christmas photographs for the McKeldin family. In the early sixties, Marion decided to close his portrait studio and devote himself to commercial photography. As well as his regular work for the state, Marion also traveled up and down the East Coast working for industries such as Eastern Stainless Steel, architectural firms, churches, schools , and hospitals doing everything from fundraising pamphlets to annual reports. Additionally, Marion continued to shoot fine art photography, winning awards in various contests, and he also became increasingly interested in working with vintage photographs. In 1970, he and Mary, who had always been involved in the historical community in Annapolis, published Annapolis Adventure, a book combining vintage photographs with modern images of the city of Annapolis. The techniques that Marion had learned as a young man involving glass lantern slides and glass plate negatives once again were valuable to him as he and his youngest daughter Mame traveled throughout the state during the seventies and eighties collecting and making copies of vintage photographs for inclusion in the four books of historic photographs they co-authored. From 1974 through 1987, Marion and his wife ran a gallery on Maryland Avenue in Annapolis in order to market his fine art photographs, which had always been in great demand from individuals, businesses, and interior designers. 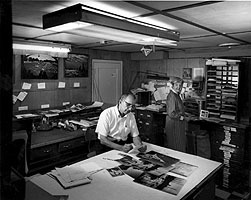 Finally in 1987 Marion retired from commercial work and donated his stock, consisting of over 100,000 negatives and prints, to the Maryland State Archives. The Marion E. Warren Collection, with its original photographs by Marion and large number of copy photographs of vintage prints and negatives, forms the backbone of the photographic collections at the Maryland State Archives. In the 10 years since his retirement, Marion has continued to work on books, calendars, posters, and other media. He has also added to his collection through the Bay Project, an effort to document the people and environs of the Chesapeake Bay. He is still very active in the Annapolis community that has been his home for almost 50 years. The author would like to thank Mame Warren, whose oral history interviews and chronology written for "The Eye of the Beholder" exhibit catalog were the sources for this biography. Further information was provided by conversations with Marion E. Warren himself.